Here’s the deal…When you are looking at leather replacement seat covers online, don’t always trust the exact color you see on the monitor. 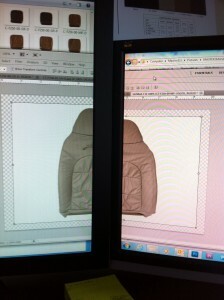 The color can and will appear drastically different on every monitor. This is due to the many different manufacturers, models, and color settings of the monitor. These monitor variances make it virtually impossible to match the color of a pictured seat cover to exactly how it appears in real life. The picture below shows what I mean. I took this picture of a seat cover while it was “straddled” in between 2 monitors. As you can see, the color of the leather appears very different on each monitor, making it difficult to interpret the “real life” color of the leather. Also, when picturing the covers, the light and shadowing plays a major role in how the camera captures the color. Leather color will vary under every different light and/or shadow We guarantee the new leather cover will match with the original factory color pallet, once the existing leather is cleaned. So don’t be alarmed if the color on the monitor doesn’t exactly match your interior. Here is a great video I found that will show you how colors and perceptions are not always what they appear to be. If you have any questions about replacement leather seat covers, feel free to give us a call at 214-710-2565, or check us out on the web at www.theseatshop.com.